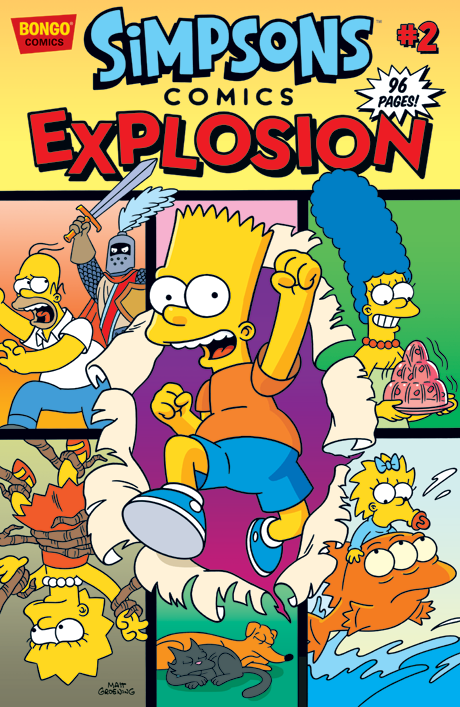 By Matt Groening & Misc. Bongo’s annual, oversized, 96-page comic returns, tightly packed with megatons of explosive stories that will blow your mind! First, while the citizens of Springfield are tackling a tornado that is tearing through town, Homer finds himself hurtling through a time-travelling adventure of his own. Then, Martin Prince decides to make a move up the Springfield Elementary food chain by auditioning for the role of Bart’s second banana. And in a tale that will fill you with dread, the Simpson family finds shelter in a cabin in the woods. Then, Lisa gives Bart a little familial competition for the title of Class Clown; Moe hires the barmaid of his dreams; Pieman and the Cupcake Kid take on a new crime team, Glutenus Maximus and his sidekick Gluten Tag, whose pastry-related misdeeds have led to a ban on all baked goods in Springfield; and the sons of the Legitimate Businessman’s Social Club associates (aka the Mafia) take over on the “bully” trade at Springfield Elementary.